← 4 Signs: Is It the Right Time to Enlist for Home Care? How dangerous is dehydration? Is it something to be alarmed about? It most certainly is. Dehydration can lead to a series of health complications if left untreated. At first, it may simply start with a case of dizziness and confusion. Over time, it can result to heat stroke, urinary tract infection, kidney problems, seizures, and even decrease in overall blood volume! 1. Setting a reminder to drink water. A lot of us are at risk for dehydration simply because we forget to drink water. Funny, isn’t it? This is especially true if you’re enjoying your tasks at hand. The time just passes quickly without you realizing it. It’s often too late when you realize that you haven’t drunk enough water! Make sure you stay hydrated by inputting an alarmed reminder on your phone or other gadgets. 2. Having a drink with every meal. This trick goes a long way. It can help you with managing your weight too! How? The more water you drink, the less likely you will feel hungry. It will aid you in controlling the portions you consume, so you avoid overeating effortlessly. Why don’t you give it a try? Drinking water is not the only way you can stay hydrated. A tasty way to improve your state of hydration is by having soup together with your meals. There is a wide variety of soups to choose from. They work well with almost any menu you have planned out too. And most of all, soups are easy to cook, easy to digest, and are highly nutritious to boot! Which flavor of soup is your favorite? 4. Eating more fruits and vegetables. Fruits and veggies aren’t just full or fiber. They are a good source of hydration too. Watermelons, cucumbers, and celery are especially high in water content. Not only are they a versatile addition to various recipes, they can also be snacks too. Not fond of drinking plain water? Don’t worry. You have other options, like natural fruit juices! If you want, you can even juice fruits and vegetables on your own. You can also try making infused waters. Just cut up thin slices of fruit (try lemon!) and add them to a cold pitcher of water. Then, voila! Water will no longer taste boring! Dehydration is dangerous and therefore should be avoided at all costs. 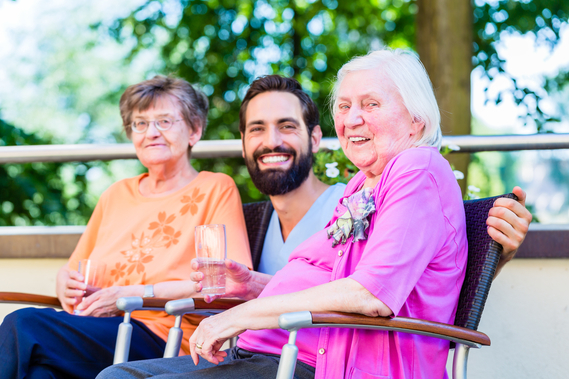 If you have trouble staying hydrated throughout the day, a home health aide in Pennsylvania from AG Home Care Services, LLC will be more than happy to help you. They will politely remind you to have a drink and help you in preparing juices, soups, and daily meals too. Enjoy our home care services in Philadelphia, Pennsylvania with AG Home Care Services, LLC today. Let us know how else we can help you! This entry was posted in Home Care Services and tagged Certified Nursing Assistant, Dehydration, Healthy Living. Bookmark the permalink.